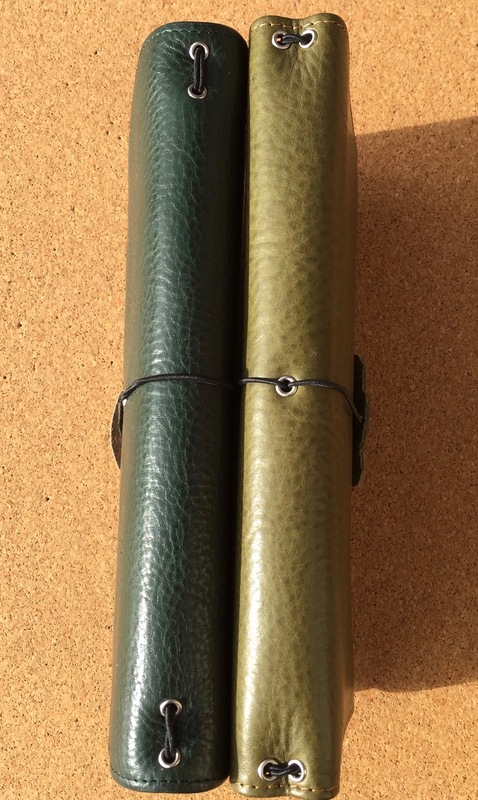 I’ve owned both of these Travellers Notebook covers for over 6 months. 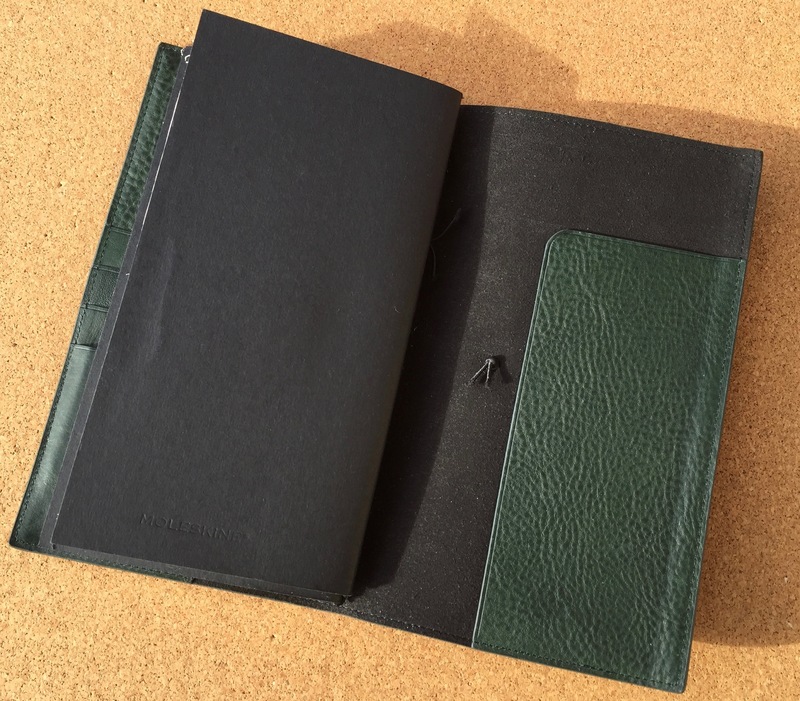 The Gillio Giramondo was used as my travel journal during our extensive holiday in the USA and Canada in 2015. I bought the Giramondo at the meet up in Brussels in March. 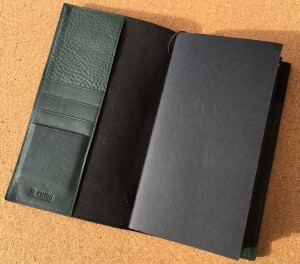 The Nomad was a review sample sent to me in the summer and I reviewed it separately at that time. However, having now had a chance to use both for longer than a few days, it seemed only right to do a comparison review. Comparison of the features of each model. The Gillio Giramondo featured in the photos is my own example. Please note that since I purchased this item Gillio have changed the design. It now has leather on the inside in the same colour as the outside. (See the photograph at the end of this section). However, this is the only difference and the price details in the table below refer to the current model at the time of writing. 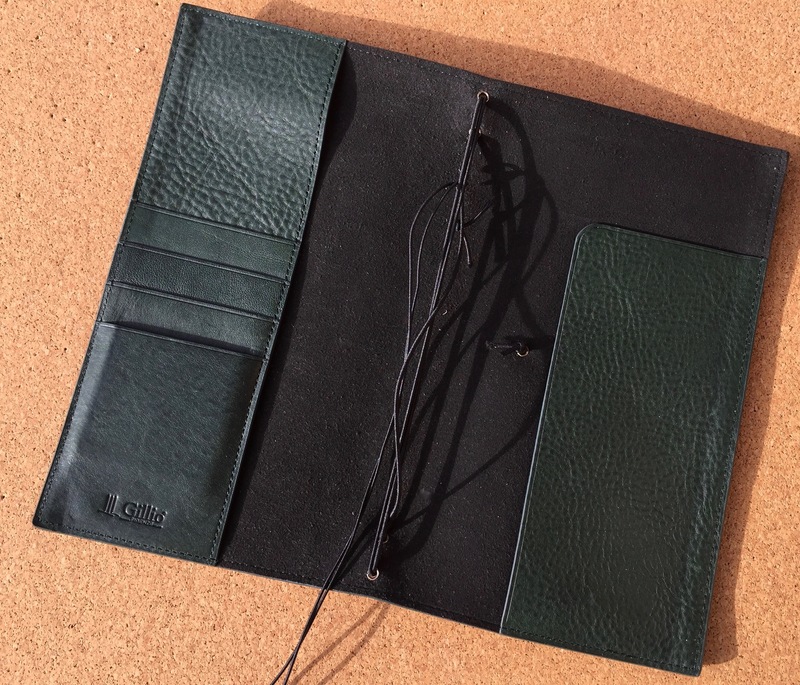 The Giramondo is made from Italian Epoca vegetable dyed leather, the texture and the colour might vary slightly from one item to another and within the same item. 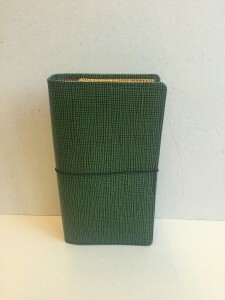 The inside front cover features a full height slot pocket and 3 credit card pockets and a business card slot at the foot. The rear inside cover features a secretarial flap pocket. 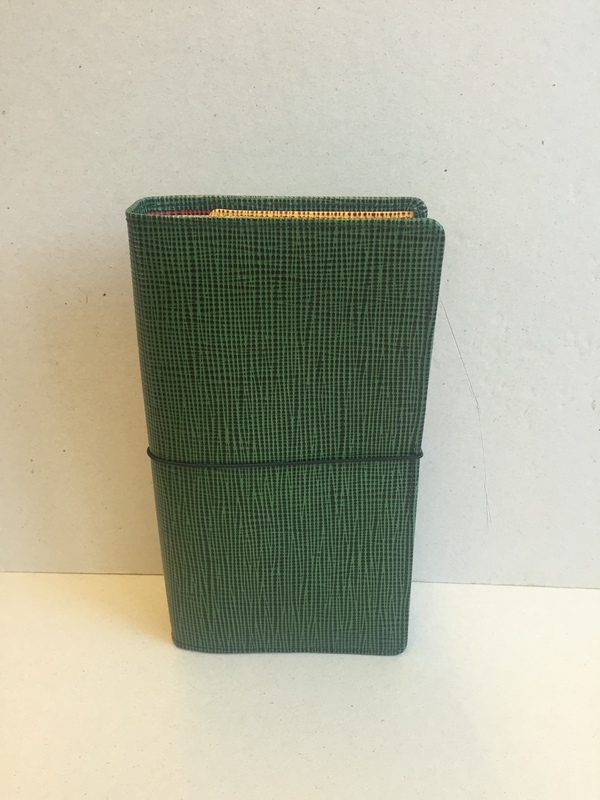 You will also notice that the closure elastic comes through the back cover rather than the spine of the cover. Turning the empty cover over we see the outside and the riveted holes for the elastics. I added the leather sample you can see on the closure elastic to act as a pen holder and it also protects the edges of the leather from indents from the elastic. This is the new full leather interior in the same colour as my own one. The Nomad shown here is the same as the one I reviewed in August 2015. This product came about as a result of a collaboration between Petra Van der Spek, Janet Carr and myself when we met for the first time in October 2014. 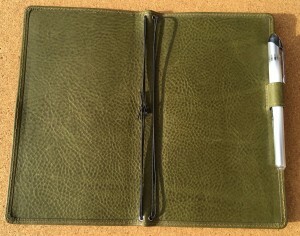 The Nomad shown here is the basic cover with the addition of the pen loop. 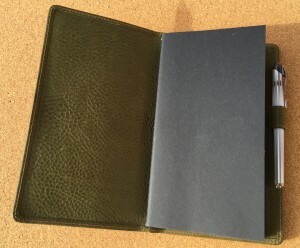 Showing the inside of this plain basic cover. 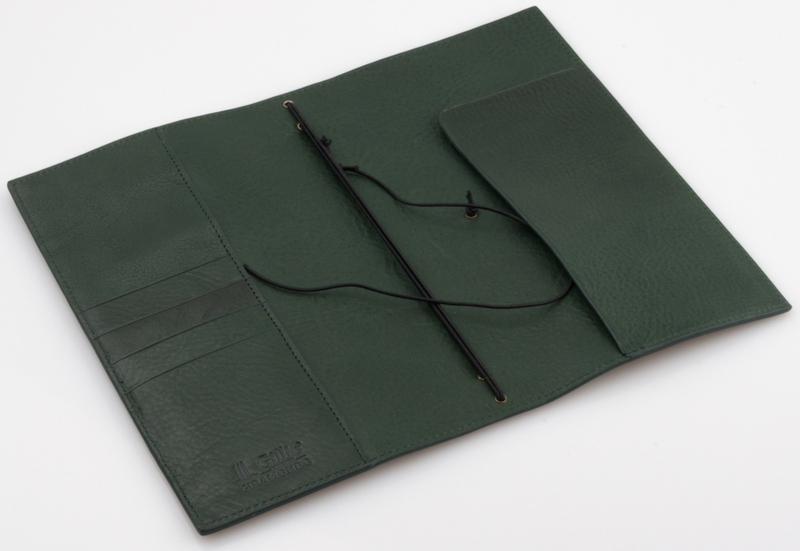 Without any pockets it gives you a pleasant uncluttered writing surface to write against. 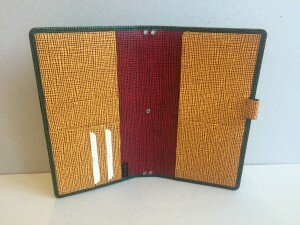 Here is the interior of another Nomad that has all the available options, the front cover features the full height slip pocket and credit card slots. The rear inside cover has a full height secretarial pocket, this also has a business card pocket at the foot. 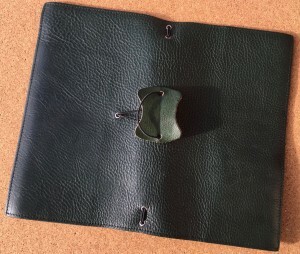 The elasticated pen loop as well. 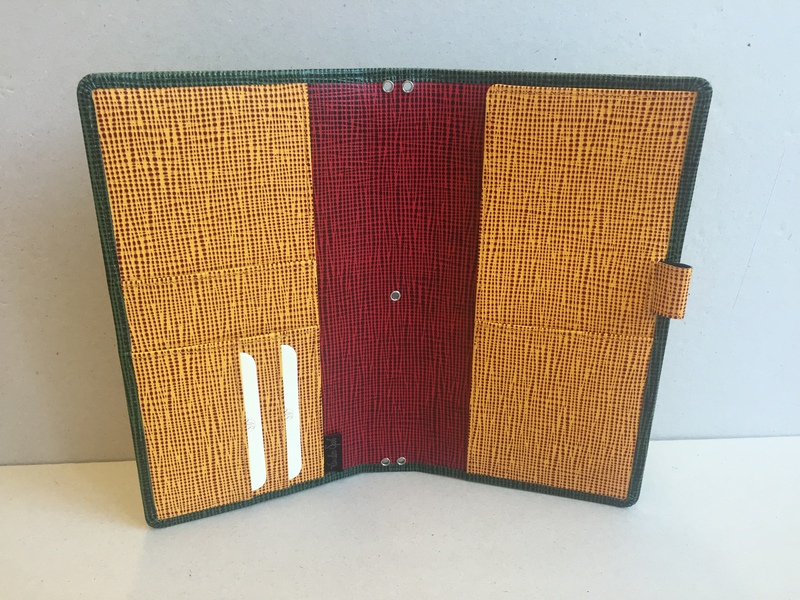 This particular cover was created using three different colours of the ‘LV’ inspired textured leather. Thank you to Janet for the photos, you can read the full story about this one on This Bug’s Life. The ‘Making of’ post for my Nomad cover is also on this blog. Continuing the comparison, if you stand the two models next to each other. The Nomad is factionally taller. Looking close up at the rivets and the spine. 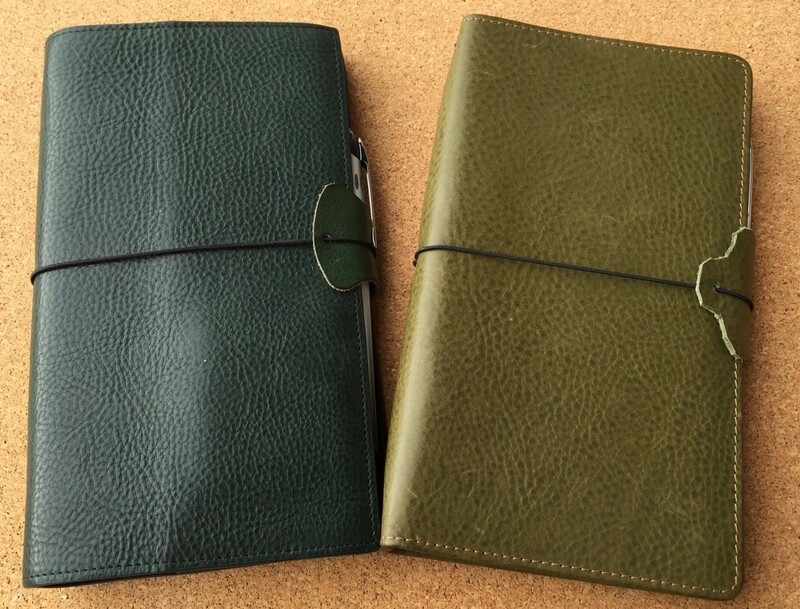 There are dozens of other creators of Travellers Notebook covers now. 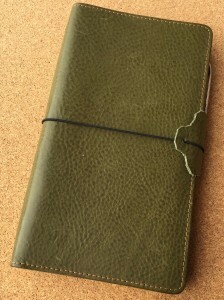 There still is the Midori Traveler’s Notebook made by the ‘Traveler’s Company. 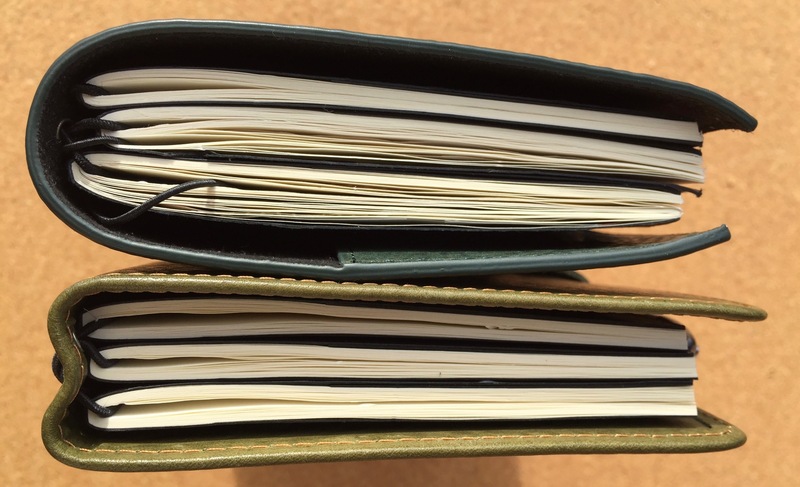 Janet did an excellent post looking at the Midori vs. the alternatives, it is worth a read. Looking on Etsy you will find lots of options on there, but a word of caution. 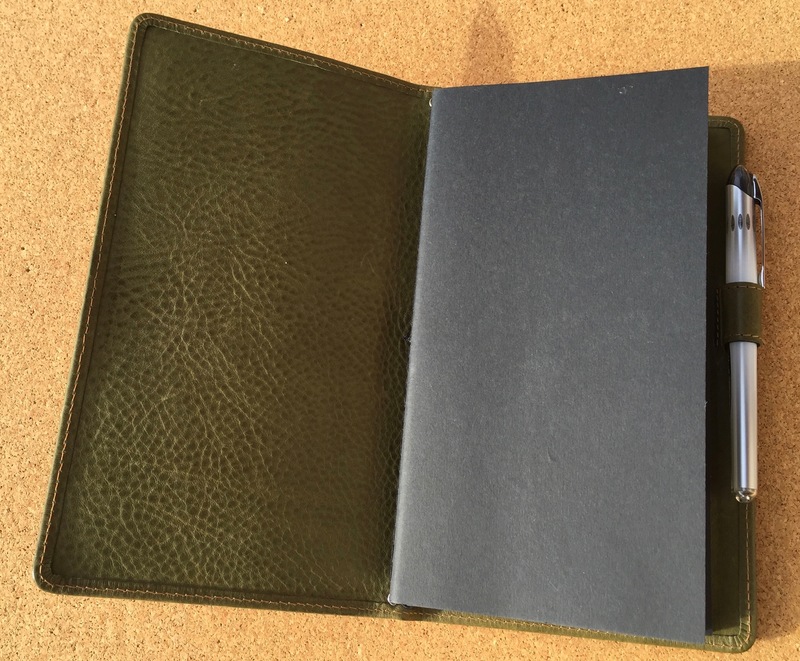 A lot of the companies show the initial price for the smallest size in their range, select a normal size cover (for booklets 110x210mm) and in some cases the price can double. If you live in Europe and if you are buying from outside of Europe, be aware of the pricing and how it can add up. One example I looked at on the Internet was priced at $118 with shipping an additional $20. This converts to approximately €127, on importing this to Europe you would be liable for VAT at your local rate (say 21%) this takes the price up to approximately €154 in addition there might be import duty and a handling fee to account for. This would make this particular example potentially more expensive than either of the models shown here. I’m not going to go in to detail about other brands, because I don’t have samples of them to compare to the Gillio or the Van der Spek, so it wouldn’t be a fair comparison. 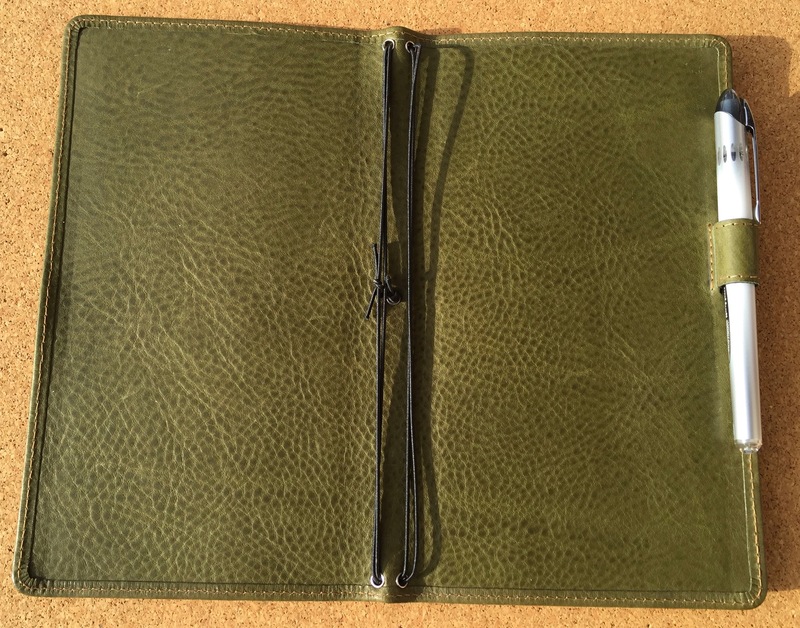 Choosing a cover is a very personal thing, the style, the type of leather and the workmanship that has gone in to it will vary. 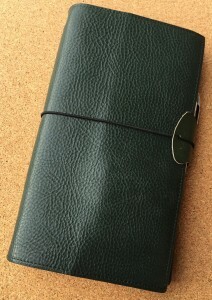 What I can say is that although Gillio and Van der Spek have only recently entered the Travellers Notebook cover market, they both have years of experience in selling leather goods and in the case of Van der Spek, the family have been making leather goods for some 80+ years through several generations. Both companies featured here are small family concerns, they and their staff work continuously to satisfy their customers requirements and provide excellent customer service. Van der Spek never seem to say no to anything people ask for in terms of customising their own designs. Whilst Gillio work in a different way, they are constantly introducing new colours and sizes. Whilst Van der Spek are making each item to order and can make more or less anything you want out of their wide range of leathers. For me there isn’t an overall ‘winner’ in this review, I think that they are just as good as each other. Owning both is like having a Bentley and a Rolls Royce parked in your garage. Some days you use one, other days you go for the other. You like and enjoy each one for slightly different reasons. Thanks for the great review Steve ! 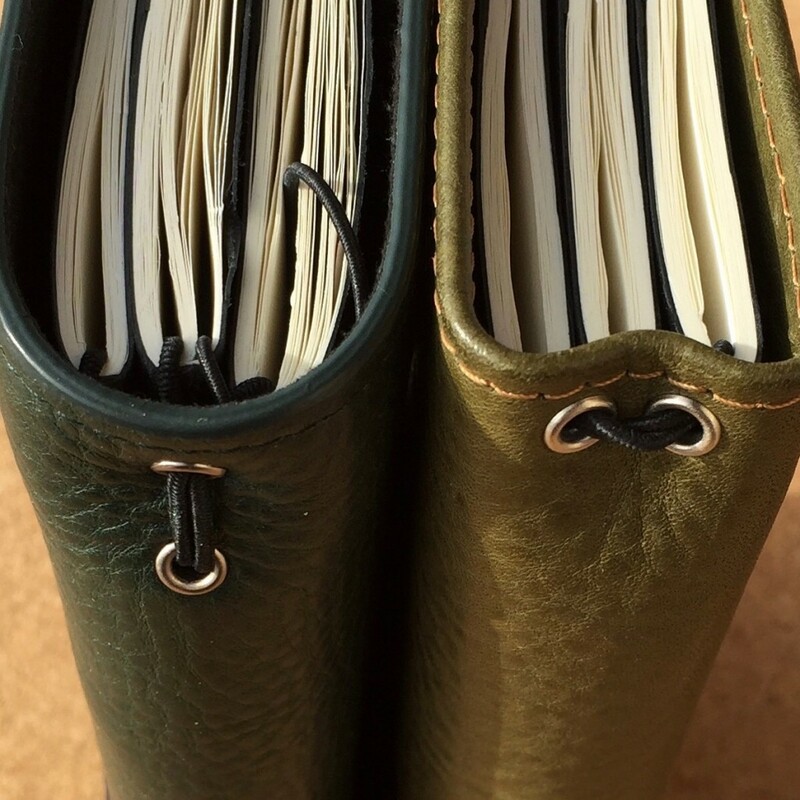 How do you compare Janet leather vs epoca leather? In terms of touch, suppleness, smell, characteristics (scratch test included) they are the same. I can not detect any difference in the way they handle. I’ve tortured a couple of JL 104 samples with water and wax and scratching them multiple times and it recovers every time. Over time with the amount of repeat handling that sample has had it has gone darker in colour but I would have expected that to happen. I have a giramondo coming on my way this week.